Chefs often work in close quarters near hot ovens and various sharp cooking utensils. Chefs face numerous hazards in the kitchen, especially if the cooking staff is small and trying to cover many roles. The majority of accidents happen because of the stress and pace of the kitchen, and can include severe cuts, burns, dehydration and mental fatigue. Most of these hazards can be minimized by proper staffing; however, most restaurants cannot properly compensate a chef let alone afford a well seasoned staff to help alleviate some of the stress. Chefs don't always get a properly trained staff. Teaching new cooks how to do their job makes the daily tasks more difficult because it adds additional stress to the kitchen's daily operation. An improperly trained staff alone, can increase the risk of injury on the job. 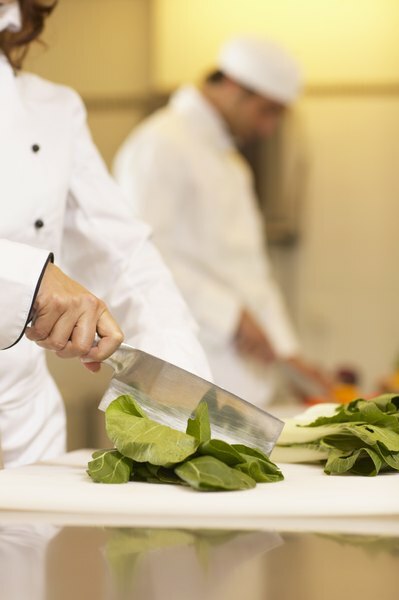 Wounds and lacerations from using food preparation utensils are the most common hazards for chefs, according to a survey commissioned by the State of Queensland in Australia. Cuts can include small, paper-cut sized wounds to actually losing a tip of a finger. Workers need enough time to work safely and the right knives for each job to lower the frequency of cuts. A professional kitchen is a slippery place to work, from water from the dishwasher to spills by the staff that go unattended. A chef is often moving from one point to another in a hurry, and is prone to slips and falls. The Connecticut Department of Public Health recommends addressing this by using non-slip matting, no-skid waxes and coat floors with grit in greasy areas. Chefs who work with hot elements all day long are constantly prone to burns. Even using a wet towel to grab a hot pan can create a steam burn, usually occurring to the palm of your hand. Chefs also regularly experience the danger of randomly bumping into hot equipment, touching scalding grease and handling hot food. 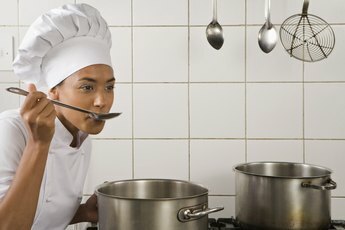 Being a chef requires physical stamina and strength to lift heavy pots, cartons with food products and kettles with gallons of water in them. Commercial bags of dry goods, such as flour and sugar, may come in a 50 pound bag or heavier. Muscle and tendon sprains are common, especially in the back and legs. Additional strain can be caused by standing on your feet all day with incorrect posture. Commercial kitchens can develop microorganisms that contaminate the environment and affect chefs. Viruses can be carried on just about any surface and survive for months. Parasites, fungi and bacteria can get on a chef's hands after handling food the pathogens have been living in. Other chemical hazards can include leftover equipment residue, contaminant metals, cleaning solutions and insecticides. Even the constant exposure to dry ingredients can cause a chef to experience shortness of breath, hoarseness and coughing. How Can I Get Certified to Work With Food in a Restaurant? Can Frozen Food Thawed & Refrozen Cause Food Poisoning?